Remember the paper I mentioned the other day, that showed how a symbiotic virus causes aphids to grow wings? Amazing at that may be, an equally amazing thing is that it’s not unique. A new paper1 points to a different species, and a different symbiont, that also flips the switch on flight. There are some differences: the host is a spider, not an insect; the symbiont is a bacterium, not a virus; and the symbiont switches flight off, not on. But, you know, we’re talking about concepts, here, and conceptually this is remarkably similar. 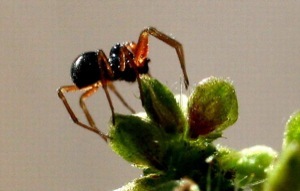 The spider is Erigone atra, a “money spider”, an agriculturally important species (they control pests). They’re widespread and successful, and one of the reasons is their aeronautical ability. Like many other spiders, E. atra can travel many miles via “ballooning” — spinning a long, fine strand of silk that catches the breeze and takes them floating to a new habitat. Also like many (if not all) arthropods, E. atra has a host of endosymbiotic bacteria. The most famous of the arthropod endosymbionts are the Wohlbachia family, which do utterly incredible things to to their hosts in order to spread their (the Wohlbachia’s) genes; but there are many other bacterial symbionts. Treating the spiders with antibiotics (thus “curing” them of their endosymbionts — specifically, curing them of Rickettsia) changed their ballooning behavior: Treated, Rickettsia-free spiders were six times more likely to balloon. Ballooning is more than shooting out a web and hoping, it’s a complex behavior: “a stereotypical ‘tiptoeing’ posture, which is exclusively used for aerial dispersal (comprising leg stretching, abdomen raising and production of silk threads that are used as sails) “,1 and this behavior was strongly suppressed in Rickettsia-infected spiders. My own speculation here … One critical difference between the aphids and the spiders is that the spiders are much more versatile. Aphids grow on a tiny, constrained food source, and then have to fly to find a new food source (and, I believe, to breed) (Update: See comment #2 for more a informed explanation of aphid lifestyles). These spiders, on the other hand, can disperse locally as well as aeronatically; there are local communities of spiders that can be reached without ballooning, so they’re not dependent on flight to propagate the species. Ballooning takes the spiders to new, sparsely-settled regions, where there’s less competition for resources. But that’s also a region where there are fewer hosts for the bacteria. Building up a reasonably dense local spider population might be in the bacteria’s best interests, and suppressing ballooning might help do that. Microbial modification of host long-distance dispersal capacity. Sara L Goodacre, Oliver Y Martin, Dries Bonte, Linda Hutchings, Chris Woolley, Kamal Ibrahim, C.F. George Thomas and Godfrey M Hewitt. This entry is filed under Bacteria. You can follow any responses to this entry through the RSS 2.0 feed. Both comments and pings are currently closed. Aphids generally reproduce asexually (no males!) during most of the growing season. These are born pregnant and lay live babies (=vivipary; look for the little red eyes in the abdomen of a light colored aphid! ), the rapidly increasing population overtaking plant growth in some cases. Although winged forms can appear when the aphids (not all species have known males) are ready to mate, this is usually only in the autumn. Most of the time, viviparous winged aphids start to outnumber non-winged adults in response to dwindling host plant resources (a process starting in the grandmother’s generation). Whether or not these winged aphids will travel long distances will depend on the species, whether they are physiologically ready to migrate or not, and whether or not the atmospheric motion systems are favorable at the right time. 2.) Does the bacteria have to “want” the spiders to balloon or not to balloon? I understand that the ability of the bacteria to prevent the spider from ballooning would have evolved, but it doesn’t necessarily have to be beneficial or harmful to either species, does it? It could just be neutral, couldn’t it? It was neither harmful nor helpful, and nothing ever caused it to be bred out of the bacterium, etc. Even if that’s true, though, there probably is some beneficial aspect that we just haven’t figured out yet. 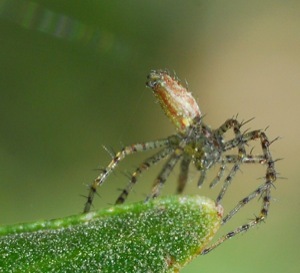 Spiders are often underestimated as suitable behavioural models because due to their small brains, their behaviour is innate and mostly invariable. Great conclusion! I think evolution in any scenario is one of lifes most exciting facts. Fantastic fact about the balooning. I wasn’t aware spiders were capable of this! I have to mostly incline to your way of describing bacteria effects. It’s really hard to prove that bacteria “wants” or “does” anything on purpose. I believe that ballooning prevention in spiders is neutral, simply a coincidence. I thought I had heard it all, but this absolutely stuns me. I grew up watching nature documentaries on PBS and never have I heard of anything like this. Our natural world is full of wonders and seems we just keep learning new things everyday. I tend to think that this must have had some considerable effect on the evolution of life and also wonder if a similar situation has happened with mammal or even human beings!